I don’t really understand that sentence. It was probably meant to say the tags don’t need batteries. very interesting, I wonder if the sensors will also be vulnerable to the NFCKill. I would imagine that it would. I am not familiar with NFCKill specifically but if it is an attack where the tag is given a kill command, permanently bricking it, then it would be an issue. I have played around with Sparkfun’s UHF RFID shield and those tags have a very obvious kill command. I believe it blows an internal fuse. Is that how NFCKill works or does it write garbage and write-protect the data? I had never heard of NFCKill before so I went to their website. Now I wonder if I could mount one outside my workplace entrance and disguise it to look like a card reader. NFCKill dumps a shitload of energy into the aether, hoping to EMP-fry the target device. Give it some certification and you can charge a lot in security situations where customers want guaranteed destruction of old keys, and are too much a set of pussies to just use a blowtorch. Or maybe a drill. It’s just struck me I have no idea what the collective noun for that is. I have been trying to do this myself! Poor luck soldering to the antenna traces though. You have no idea how happy it makes me to see that it has been done and that I can do it myself. NFCKill was mentioning that these tags could be vulnerable to bricking attacks and keeping a tag “offline” most of the time, could avoid some roaming ne’er-do-well’s attacks. Thank you for the link. There was a story on HAD a couple of months ago, about a team who’ve got an RFID tag to power a keypad, 12 buttons, entirely passively. There aren’t even any real “components”, it’s all just printed foil on a backing, producing the necessary resonant pieces. The keypad is capacitive buttons, ie only one contact per key. 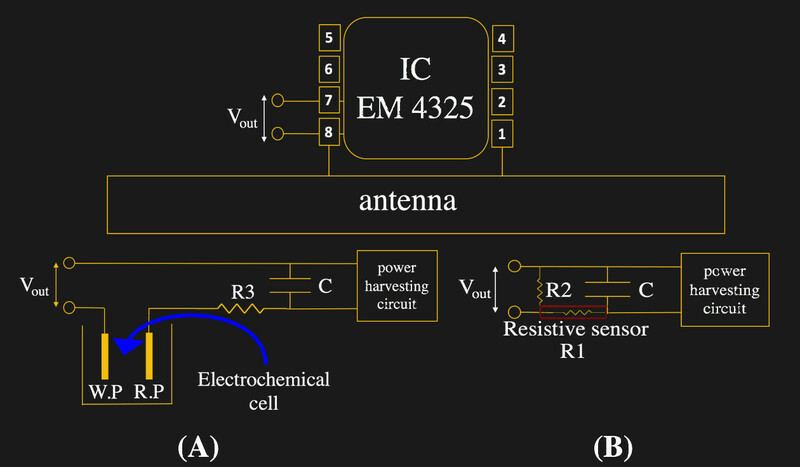 And just this elaborate piece of foil is enough to perturb RFID waves in such a way that the pad can be read from a reasonable distance, with several uniquely identifiable units. It was Wifi! Still dead clever, and a similar principle. And how does car tire pressure sensors work? I have not looked into that, but I’ve always assumed it was related to rfid. There’s a radio on the back side of the valve. Battery will last a dozen years or so. Cheaper units (cars) used the ABS system by measuring the rotation of the wheels/tyres. A tire/tyre low on air pressure will turn a bit slower than the others. But the main drawbacks of that system, are that it only works while the car is moving, and it doesn’t work (as well?) if more than one tyre/tire is low in pressure. A lower pressure tire has a smaller effective radius. This means it has to turn faster. There’s some good TPMS-decoding software for the RTLSDR and similar radios. Check out the “background” section of this page: https://github.com/jboone/tpms and watch the linked videos. The Windows SDK is a gigantic bloatware, but it’s possible to grab from it the minimum of BSP files to efficiently compile on Linux with a make. is there a flow sensor, which can measure water flow inside a steel pipe without obstructing the water flow (gravitational flow)? Ultrasonic flow sensors don’t obstruct the flow. Ultrasonic is good. Magnetic flow meters also won’t obstruct flow, but the working fluid needs to be conductive. None of these are really low power though. For low power, I think a differential pressure measurement would be best, but that obviously is going to restrict the flow. Yeah, but if you have nice enough pressure sensors, you can just install them a few feet away from each other on the existing plumbing, and measure the pressure drop that was already deemed acceptable when the system was built with that plumbing in the first place. It’s like tapping either end of a power wire and treating it as an ammeter shunt — calibration takes a moment (and varies a bit with temperature), but you can claim zero shunt losses. Seems stretch sensors would be better. Installed during manufacture at proper pressure, and could detect over, and under inflation since they’re both deviations from the norm. Many pressure sensors work in that way. You have a sealed chamber at a certain pressure, with a hole on it. Across the hole is a membrane that measures stretch. The sensed pressure is on the other side from the pressurised chamber, so ballooning and stretching the membrane. So a pressure sensor is often just a stretch sensor + a known pressure.